8mm is the default width for this ring, but please note at checkout if you prefer a 4mm, 6mm, 10mm or 12mm! 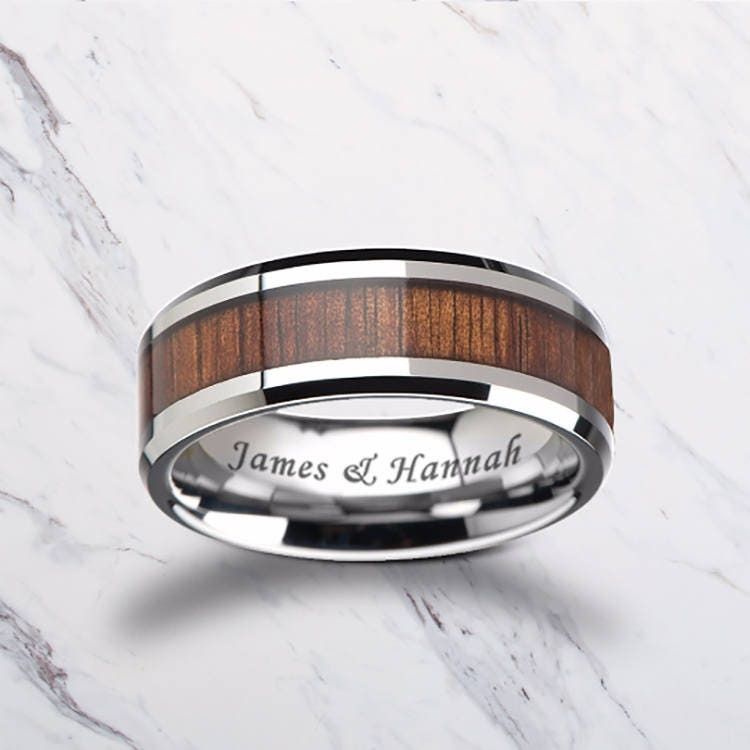 This is a bevel edged & polished tungsten carbide koa wood inlay ring with a custom engraving of your choice inside of the ring. Koa wood is famous for how rare it is to harvest. You can only legally harvest naturally fallen Koa wood! Koa wood is a beautiful lightly dark and rich brown that glimmers in the sunlight. All of our wood rings have a clear resin covering the natural real wood inlaid into the center. Tungsten carbide is extremely scratch resistant, but the resin is not. All of our rings are not indestructible and can scratch if hit against blunt objects or dropped like all jewelry.